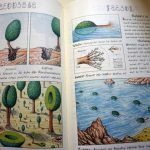 Codex Seraphinianus is a book written and illustrated by the Italian artist Luigi Serafini (b. 1949) between 1976 and 1978. Its first edition was published in 1981 by Franco Maria Ricci in a limited edition of 5000 artfully-bound copies. 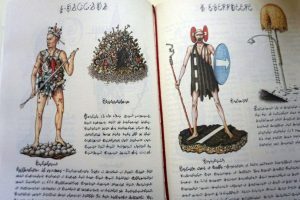 The book is composed by 360 pages and it’s written in a cipher alphabet in an imaginary language. The writing system and the language of the book has defied complete analysis by linguists for decades. 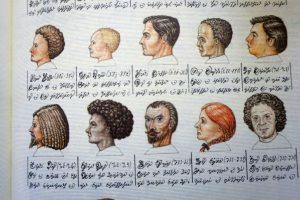 The number system used for numbering the pages has been cracked by Bulgarina linguist Ivan Derzhanski and by Allan C. Wechsler and it’s a variation of base 21. 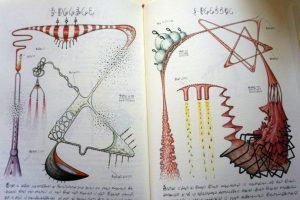 In 2009, during a talk at the Oxford University Society of Bibliophiles, Serafini stated that there is no meaning hidden behind the Codex. The book was very appreciated by Italo Calvino, Federico Fellini, Achille Bonito Oliva, Tim Burton, Douglas Hofstadter among the others and it will be published again in Italy by Franco Maria Ricci soon. In the beginning, there was language. In the universe Luigi Serafini inhabits and depicts, I believe that written language preceded the images: beneath the form of a meticulous, agile, and limpid cursive (and strength lies in admitting it is limpid), that we always feel on the point of deciphering them just when each word and each letter escapes us. If the Other Universe communicates anguish to us, it’s less because it differs from ours than because it resembles it: the writing, in the same way, could have developed very similarly to ours in a linguistic forum that is unknown to us, without being altogether unknowable. Reflecting on it, it occurs to me that Serafini’s language does not distinguish itself only by its alphabet, but also by its syntax: the objects of this universe evoke the language of the artist, such as we see them illustrated in the pages of his encyclopedia, and are almost always identifiable, but their mutual relations appear psychologically disturbed to us by their unexpected relationships and connections. (I say “almost always”: there are some unknowable forms that serve an important function that I will try to explain later on.) Here is the conclusive point: endowed with the power to evoke a world in which the syntax of things is subverted, the Serafinian writing must hide, beneath the mystery of its indecipherable surface, a more profound mystery touching on the internal logic of language and thought. The lines that connect the images of this world tangle and cross; the confusion of the visual attributes gives birth to monsters, Serafini’s teratological universe. But the teratology itself implicates a logic which appears to us to, turn by turn, flower and disappear, at the same time giving us the sense that the words are carefully traced back to the point of the quill. Like Ovid, and his Metamorphoses, Serafini believes in the contiguity and permeability of all the domains of being. Anatomy and mechanics exchange their morphologies: instead of a hand, one finds a hammer and pliers at the end of an arm; a pair of legs rest, not on feet, but on wheels. 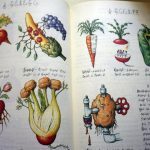 The human and the vegetative complete one another: in the page consecrated to the growth of the human body, a forest sprouts atop a head, climbing vines curl around legs, prairies cover the palms of hands, carnations flower from ears. The vegetative espouses merchandise (one finds plants whose stems are unwrapped bonbons, whose ears of corn are replaced by pencils, leaves by scissors, fruits by matches), the zoological marries with the mineralogical (dogs and horses are petrified at mid-body), all aspects of architecture are allied with the geological, the heraldic with the technological, the wild with the urbane, the written with the living. Similarly, certain animals take the form of other species who share their habitat, just as living beings find themselves contaminated by the form of objects in their environment. In this passage from one form to another, one may observe the successive phases of the coupling of a man and a woman, metamorphing little by little into a reptile. It’s one of Serafini’s most felicitous visual inventions. In my list of favorites, I would site next the fish that, rising to the surface of the water, call to mind the big eyes of a movie theater; and the plants in the form of a seat, which must be cut and pared down in order to get a chair of the best feel; to which I would add all of the figures where the motif of the rainbow appears. The skeleton, the egg, and the rainbow are, in my eyes, the images that spark Serafini’s greatest visual ecstasy. One could say that the skeleton is the only core of reality that, in this world of interchangeable forms, remains just as it is: thus, see the skeletons awaiting the moment to put back on their envelopes of skin and flesh (suspended from hooks, they float like vacant clothing), then, once clothed, perplexed, they contemplate themselves in the mirror. Another page conjures a city of skeletons, where television antennae replace the bones, and where a skeleton-waiter serves a bone on a plate. With or without its shell, the egg is the original element that appears beneath all of these forms. A hose falls on a meadow of shucked eggs, that immediately pussyfoot out of the grass like organisms endowed with a perfect autonomy of movement, next climb a tree and let themselves fall to the ground anew, taking this time the characteristic form of eggs on a plate. As to the rainbow, its importance is vital in Serafini’s cosmology. Solid like a bridge, it can sustain an entire city; once again, this city changes its color and consistency at the same time its support does. Emitted from the rainbow, at the several circular piercings in its iridescent tube, are certain bidimensional, multicolored corpuscles in irregular and never-seen forms, that could very well be the vital principle of this universe, as representative of the generative corpuscles of the unstoppable general metamorphosis. 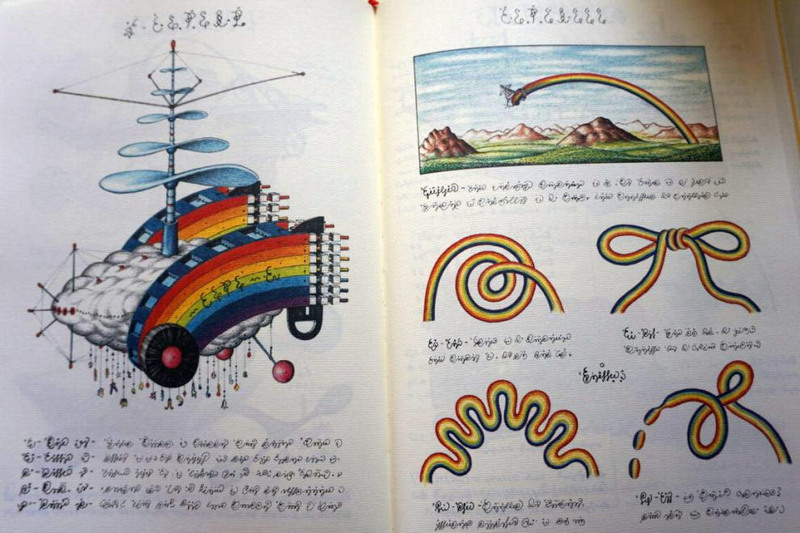 On other pages, one sees rainbows hung like clouds from a sort of helicopter: they are given a classic form, semicircular, but also drawn like knots, zigzags, spirals, droplets. A number of the polychromatic corpuscles are suspended, by threads, from the cloudy fuselage of the machine. Is this derived from its mechanical counterparts of iridescent dust? Or really from hooks fishing for colors? As I suggested above, these are the sole indefinable forms of the Serafinian cosmorama. These beings’ morphological neighbors appear, in the form of luminous corpuscles (photons? 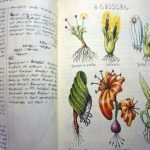 ), in a swarm escaping from a lantern; one also finds them carefully identified, as characteristic of microorganisms at the beginning of the botanical and zoological sections of a contemporary encyclopedia. Maybe they have the same composition as graphic signs: they constitute again another alphabet, more mysterious and more archaic. (In fact, one sees similarly represented forms sculpted on a sort of Rosetta stone, with the “translation” available). It may well be that all Serafini shows us is of writing: only the code varies. In this writing-universe, the almost identical roots are catalogued under different names, because each linguistic element is a differential sign. The plants entangle their supple stems, all this like the entanglements of the lights that the quill traces; returning understood from where they sprout, the plants surface again, a little farther, and they don’t even give birth to subterranean flowers. 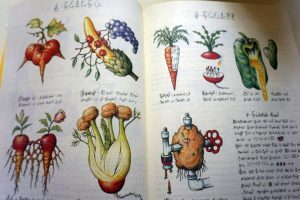 The vegetative forms prolong the taxonomy of imaginary plants, such as was inaugurated by Nonsense Botany by Edward Lear and followed by the sidereal Botanica Parallela of Leo Lionni. In Serafini’s tree nursery, one finds cloud leaves that water the flowers, spider web leaves that catch insects. There are shrubberies that uproot themselves on their own and head off, in the direction of the ocean, where they raise their anchors, making their roots turn like the propellers of a motor boat. Serafini’s zoology is always worrisome, monstrous, nightmarish. Its evolution is ruled by the laws of metaphor (the sausage-serpent, the snake-lace in a tennis shoe), of metonymy (the bird made from a single feather that terminates in a bird’s head), of the condensation of images (the pigeon that is also an egg). As far as the zoological monsters, they are anthropomorphized: maybe they represent aborted attempts on the road of human evolution. The great anthropologist Leroi-Gourhan explains that man became man starting with his development of feet. 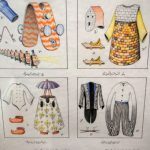 On Serafini’s pages, one can see a series of human legs that force themselves to attach, not to a torso, but to an object as incongruous as a pelican or an umbrella, or even to the simple luminosity of a lit, sparkling star. We see a crowd of beings of this last species in one of the most mysterious folios of the work: upright on a small, drifting boat, they come down a river and pass beneath the arches of a bridge. Physics, chemistry, mineralogy inspire the most relaxing pages of Serafini’s, because they are the most abstract. But the nightmare returns with met\chanics and technology, where the teratomophism of machines doesn’t appear any less disturbing than that of the humans. (The comparison arises, this time, with Bruno Munari and the entire line of inventors of crazy machines.) When one moves into the humanities (including ethnography, history, gastronomy, games, sports, clothing, linguistics, and urbanism), one cannot fail to see the difficulties of separating the human from objects, the latter of which we see henceforth soldered with the former, ushering in an anatomic continuity. One sees likewise a perfect machine, capable of satisfying all of man’s needs, to the extent of transforming man into a coffin after his death. The ethnography is no less frightful than the other disciplines: between the diverse types of savages, taken account of with their costumes, their tools, and the characteristic habitats, we see represented a Man of filth, and a Man of extermination; but most dramatic is the man of the street, the street-man, with asphalt clothing adorned with the white regulatory dividing line. There is, in Serafini’s world, an anguish of the imagination that reaches its pentacle, perhaps, in gastronomy. A particular joy isn’t altogether banished from this world, which is evident in the technological inventions: supplied for the teeth, a plate of chewed food, which allows the eater to absorb it with a straw; a central distribution of fish with flowing water, through the conduits and faucets, to deliver fresh fish to the house. The veritable “gai savoir” [happy knowledge], for Serafini, appears to me to be linguistic. (Above all the linguistics of the written; for the anguish yet refines in spoken language, which we see leak from the lips like a blackish pulp, or instead, extracted with fishing rods from a wide open mouth.) Written language is living, it is (it suffices to prick it with a pin to draw blood), but it toys with a real autonomy and body; it could have three dimensions, become polychromatic, grab hold of small balloons that could lift it off the page, or yet jump off with a parachute. To detain certain words on the page, one must sew them on, passing the thread through the loops of the ringed letters. And if you examine the writing with a magnifying glass, the thin scrawling of ink allows one to see the strong currant of the meaning that courses through it: such as a highway, such as a crowd parading in tight rows, such as a river filled with wriggling fish. At the end of the tally (see the last page of the Codex) the destiny of all writing is to decay into dust; only the skeleton of the hand that writes survives. Lines and words detach from the page, breaking away, and here the tiny motes of dust spew forth the colored corpuscles from the rainbow, which then begin to frolic. For the vital principle of all the metamorphoses and all of the alphabets, a new cycle begins.